Many online biographies of Elizabeth Taylor will state that her mother Sarah had been a stage actress, who gave up her career upon marriage. These brief comments, don't however satisfy me. I want to know more details. So I dig. My full biography, ancestry, and movie list for Elizabeth Taylor is at my Knol "Elizabeth Taylor"
Creative Commons Attribution 3.0 License Follow Will Johnson on Twitter! Sara Sothern in 1925 as Colette in "The Dagger"
Sarah Viola Warmbrodt was born 21 Aug 1896 in Arkansas City, Cowley County, Kansas, the daughter of Samuel Sylvester "Sam" Warmbrodt (1861-1948) and his wife Anna Elizabeth Wilson (~1864-1932). In 1900, the family is found in the U.S. Federal Census that year, living at Arkansas City, Cowley County, Kansas, where he learn that Sam was born in Illinois, and his wife Anna in Ohio. The family had lived in Kansas for several years by this point, as their eldest surviving son Wilson was also born in Kansas Sep 1892. Wilson's World War I Draft Registration Card where he states that he was born in Arkansas City, Kansas, is the evidence that Sarah was also born in Arkansas City. If you quote this fact, be sure to credit it properly to this article or to me Will Johnson, wjhonson@aol.com, CountyHistorian. They are living still in Arkansas City in the U.S. Federal Census for 1910. In both 1900 and 1910, Sam is listed as owning or operating a laundry. In 1910, his son Wilson, is listed at age 17, as a photographer, in a picture gallery. Wilson moved to Fort Dodge, Iowa, married Kathleen Owen and had at least two children. C David Heymann, wrote a book called "Liz : An Intimate Biography of Elizabeth Taylor". In his book he states that Sarah and Francis met while they were both attending school in Cherokee, Oklahoma. However I doubt this is true. I think it's more likely they both were attending school in Arkansas City. Cherokee is about 60 miles or so away, and both the Taylor family and the Warmbrodt family are living in Arkansas City in the Special 1915 Kansas State Census. In his book he goes on to quote Nona Smith, a schoolmate of Francis' from his days in Cherokee, who says, "When Francis was nineteen his wealthy uncle arrived from the East Coast, to take him back to New York City, where he was buying and selling art." This is perhaps somewhat true, but the World War I Draft Registration Card for Francis shows that as "Secretary to Howard Young" he was actually living in St Louis, Missouri. Meanwhile Sarah and her parents had moved to California, where with her mother's encouragement, she began an acting career. Kitty Kelley in her book Elizabeth Taylor: The Last Star states that Sarah officially changed her name in Arkansas City, "left home before finishing high school", and with no money made it to New York City where she became an actress. I suppose this is half true, but it's also half-false. I don't know if Sarah finished high school, but she certainly didn't leave home before she was 18, as she is still living with her parents in the 1920 census. And she didn't go directly from Kansas to New York. After they all moved to California, she joined Edward Everett Horton's group, and made it to Broadway as "Mary Margaret" in the play "The Fool" (1922-1923). Her entry in the Internet Broadway Database lists five Broadway shows she was in from 1922 to 1926. "The Fool" ran from 23 Oct 1922 to Jun 1923. "The Dagger" in which she played "Colette" ran from 9 Sep 1925 closing that same month. "Arabesque" where she played "M'na" ran from 20 Oct 1925 to 7 Nov 1925. This play is also interesting in that the cast included the then little-known Bela Lugosi (1882-1956), who would shoot to fame in 1931's "Dracula". She next appeared on Broadway in "Fool's Bells", a comedy in which she played both "Lucy Grey" and "Gloria", which started 22 Dec 1925 closing that month. And "Mama Loves Papa" where she played "Nan Turner", ran from 22 Feb 1926 to Mar 1926. While looking for her next role, she happened to go with a girlfriend to the El Morocco Club in New York City, where she re-met Francis who was there with his uncle Howard Young. They begin courting then, and were married within a year. At first uncle Howard Young (1878-1972) opposed the match, until she informed him, that she would give up her acting career. "About four years ago a young girl with large dark eyes came from California to act the role of the crippled girl in "The Fool". 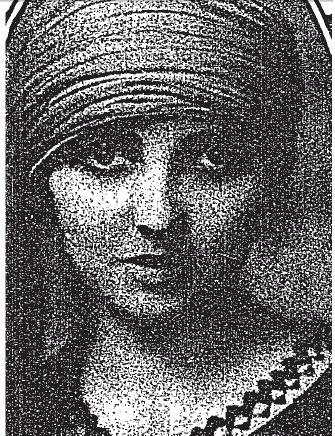 Channing Pollock's somewhat inspirational play had previously been given its premiere in Los Angeles by a repertory company which included this actress, Sara Sothern. As many who saw "The Fool" will remember, her performance was one of its outstanding features and won her a three years' engagement during which she not only played in New York and all the other large cities of America, but also had a London season, where, unless the cables and her press clippings are all wrong, she more than duplicated her success here. In her official biography it doubtless will even be recorded that she received gifts and tokens of esteem from the royal family. "But her long runs in 'the Fool' were not duplicated on her return to America. A jinx which seemed to hang over her led to her being cast in 'Arabesque,' the most pictorially beautiful of last year's failures and such now forgotten pieces as 'Fool's Bells,' 'The Dagger' and 'Mamma Loves Papa.' After such a search as that any actress would deserve a rest, and Miss Sothern accordingly went back to her home in California to get it. "When she returned she was offered the title part in 'The Little Spitfire' to succeed Sylvia Field, who had left to go in the production of 'Broadway,' impending for this week. Miss Sothern's acceptance brings the story more or less up to date, and the management of 'The Little Spitfire' certainly would not consider it anything but a public service were these columns to state in black and white that her current role seems to be her most fortunate choice since her engagement in Mr. Pollock's play." And then on 12 Oct we get the brief mention in the New York Times that : "Winifred St Clair will succeed Sara Sothern in "The Little Spitfire" at the Cort next Monday night. Sara is mentioned one last time in the New York Times on 26 Dec 1926, in restrospect of her role in "The Little Spitfire", where after commenting that four different actresses had played the part in this same Broadway season is stated that : "Sara Sothern had just returned from a visit to her home in California, and being available, she was engaged. But Miss Sothern recently left the stage forever (according to her present intention at least) in behalf of domestic bliss." Now a reader recently chastised me that Francis Taylor "never lived in New York City". To that reader I will respond: "I'm right, and you're wrong, nyah, nyah". And to back it up, the "Waterloo Evening Courier" (Waterloo, Iowa), 2 Nov 1926, at their marriage states : "...Mr Taylor is associated with his uncle Howard Young, in the Howard Young Museum of Art in New York, one of the largest art galleries in the country."